The helicopter landing nets (helideck) is a netting that is used as a helicopter base. Because as we know, helicopters can fly or land vertically, so that these nets can be used as a foundation. As we know, usually this helipad nets can be found on various roofs of large hospitals, roofs of buildings, offshore platforms, on boats and the like. Main material: Normal steel (stainless steel). It has the properties of hot dip galvanized, which is a surface that is anti-corrosion by sunlight, durable, and not easily damaged. The helicopter foundation (helipad) is marked with the letter "H" with a circle. This aims to make it visible from the air, so that the helicopter can land correctly. Very strong, so it is able to withstand the load of the helicopter and is not affected by strong winds. 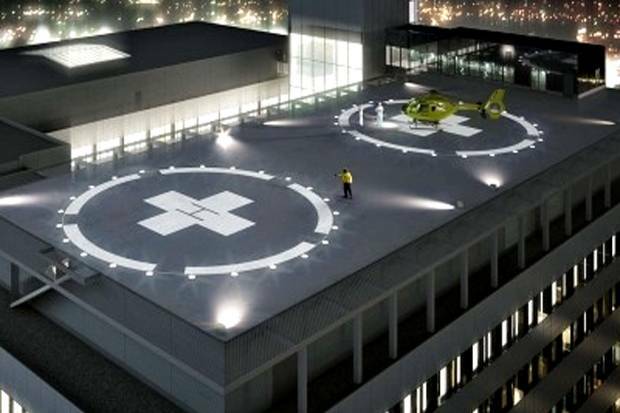 Installation of helipads in buildings such as shopping centers, hospitals, hotels, government agencies, and so on serves as an anticipation in emergency situations. When an emergency occurs in these buildings, such as building fires to accidents that cause critical casualties, they can be dealt with quickly in the presence of helicopters. In addition to functioning as a rescue, the installation of helipads can also serve to reduce congestion in land transportation. The existence of this helicopter, will be an alternative transportation that helps people to attend the event on time, without fear of being late due to traffic jams. The installation of helipads on the boat serves as the transfer of transportation goods quickly from one ship to another, or from the ship to the mainland. This will certainly help big ships, especially ships working in the middle of the ocean, such as offshore drilling vessels. Helideck helicopter landing nets can also be built in extreme conditions such as on snow. The highest helipad in the world, located in India precisely on the Siachen Glacier at a height of 21,000 feet above sea level.